London’s new railways – Crossrail, Thameslink – will not only improve journeys from the suburbs, they will also massively improve short journeys in the centre of London. The new, high-frequency railways will allow fast journeys across the centre, particularly east-west, but also create a new high-frequency link north-south. The effect should be large enough to take traffic off some of the central roads, notably Upper & Lower Thames Street and Farringdon Street. The big question is how do we use the space that this frees up: let the traffic build up again, or put the space to better use? Perhaps we should use the situation to make a step-change in the function of these routes, while we have the chance? A lot of traffic is necessary in central London, but that does not mean that all of it is necessary. Around three-quarters of the motor traffic on the Embankment and Thames Street is cars/taxis and motorcycles. The route has relatively few junctions, and is undoubtedly attracting through traffic, despite the congestion charge. The overall level of traffic is high, at around 50-60,000 motor vehicles per day. The North-South route is less busy – about 27,000 at Blackfriars Bridge and 20,000 elsewhere. Again, cars/taxis and motorbikes account for about three-quarters of the motor traffic. So how roughly, do we want these streets to function in future? There seems to be an opportunity to turn the north-south alignment, particularly New Bridge Street and Farringdon Street into a “city street” – wide pavements, some retail frontage, 20mph, single approach lanes at junctions, fairly easy to cross on foot, using medians and formal crossings at junctions. The typical arrangement for cyclists in such a street would be painted cycle lanes, kept clear by provision for loading. The east-west alignment is likely to remain busier, though we could perhaps be aiming to reduce traffic by enough that a single lane in each direction is sufficient between junctions. There is a fair amount of office frontage at the eastern end of the route, but the number of pedestrians is relatively low (partly of course due to the current volume of traffic). The exception is the area by the Tower, where there are a lot of pedestrians. There is little by way of frontage along the Embankment, though the trees and the river make it visually attractive. The section in the middle is a 250m tunnel with buildings on top, and no frontage at all. The most appropriate street type for the Embankment is “city boulevard”. This isn’t a common street type, so it’s a bit hard to say what that means. I think the main aim would probably be to widen the pavements, reduce the road to one lane each way, and generally slow the traffic down, both to reduce noise, and to reduce the barrier between the city and its river. Ideally, pedestrians should be able to cross at frequent intervals, with a median and lots of zebra crossings. Given the lack of junctions, the road is likely to remain fairly fast, so there would be an argument for separate cycle tracks, for general comfort, to support right turns, and to avoid conflicts with parking. Internationally, the normal arrangement would be to have one-way cycle tracks on both sides of the road. The route through the City is trickier. The frontage would suggest it becoming a “city street” but there is likely to be too much traffic for that. The best that can probably be achieved is a version of the “city boulevard” treatment. The basics are that there should be one lane each way, between junctions, and that the fence on the median needs to be removed. How does this compare with the current proposals for a “Crossrail for Bikes”? By starting with the Roads Task Force street types (city street, city boulevard), we reveal the choice that exists between providing for traffic and making city streets. So instead of trying to minimise the impact on traffic, we ask how much the traffic needs to be reduced to deliver one of the preferred street types. There needs to be a definite reduction in traffic, and the advent of Crossrail and Thameslink provides the opportunity for this to happen. In some ways, the half-hearted approach is just asking for trouble: people will still think of Thames Street and the Embankment as a through route, and it will just be more congested. Instead we need to make a definite leap to something different. The second main difference is that the international norm is to provide for cycling on each side of the street, rather than a two-way track on one side. The international approach relies on tight geometry and advance positioning to create safety at junctions, rather than complicated arrangements of signals. The current proposals require a very large number of traffic signals, and seem more in keeping with a high speed high traffic route. This is unnecessarily complex. Two-way tracks make sense when carving a route around a gyratory that can’t be removed, but they create too many problems to be used routinely along normal streets. The two-way track comes from a desire to fully signal the cycle route, to allow it to cater for the widest possible audience. This assumes that it is purely the form of the infrastructure that is keeping people from cycling. Cycling in central London is peculiar, by international standards, in that it is dominated by quite long trips – the average bike commute to the City is over 6km, which is about double the Dutch norm. The reality is that this length of trip is only ever going to appeal to cycling enthusiasts, and while the demographic could be broader than currently, the real problem with the infrastructure is that it is in the wrong place. If we want to normalise cycling, we have to provide for shorter trips closer to home. Making these routes in central London 100% conflict-free is unlikely to affect cycling numbers, and just adds lights, islands and complexity. I’m certainly not going to object to the Crossrail-for-bikes plans as they stand. Compared to the current situation, they are a substantial improvement. However, I think there’s a risk that they will produce more congestion, and not provide the scale of improvements for pedestrians that ought to be achieved. We need a Crossrail for everybody. 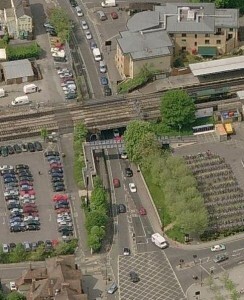 Botley Road under the rail bridge is only 8.05m wide, for a short length, between a wall on one side, and the kerb of a narrow pavement on the other. A 20mph speed limit applies. This is the only section of Botley Road without some form of cycle lane, and filling in this gap has been a top priority for more than a decade. A 1.2m cycle lane could be marked on both sides (see second picture), leaving about 2.8m lanes for general traffic. The cycle lanes can’t be narrower than that, because of the wall on one side, and drainage grills on the other. At 20mph, 2.8m traffic lanes are adequate. That’s only just enough room for two buses to pass, but manageable. There have long been ambitions to get this bridge rebuilt a bit wider, though that will only happen if there’s a railway business case for doing so. There is talk that it might happen as part of expanding the station, maybe in 2017. So – the question is – do we put up with the gap in the cycle lane for years and years, in the hope that one day we might have plenty of space? Or do we squeeze in a cycle lane, at a cost of a few thousand pounds, and risk that it might be superseded in a few years? Since a cycle lane would probably pay for itself in months, we should just do it. The sooner it is done, the bigger the payback. Turning a city into a transport paradise inevitably takes time. There’s a lot of city that needs to change, and a lot of people that can obstruct progress. So it is important to carry on taking small steps, as well as working on bigger ones. What’s on the agenda in Oxford in 2014? There are some major projects – a £900k project to make The Plain roundabout more cycle-friendly, and planning for a major extension to the Westgate shopping centre, and a rebuild of the railway station. But there should be progress on financially-smaller schemes as well. They should not be postponed yet again. While it is true that people will carry on muddling through without them, they do have a positive effect, so every postponement is an opportunity missed. There are three simple cycling schemes which should be done in 2014, and a long list of small improvements for walking where progress can be made. 1) Cycle lane under Botley Road railway bridge. The traffic-light island needs to be trimmed slightly, but otherwise this is simply a matter of painting in a cycle lane and narrowing the traffic lanes. The dimensions are all a bit tight, but adequate at 20mph. The railway bridge might get rebuilt, but it might not, and the costs of marking a cycle lane are so low that it should be done as an interim solution, regardless. 2) Cycle lanes on Marston Road. This scheme has been on hold, and should be pushed to implementation. It consists of an outbound cycle lane from London Place to John Garne Way, and cycle lanes on both sides from there to the start of the cycle tracks. The parking would all be moved to the east side and placed in a bay. 3) Parking ban on Donnington Bridge Road. Cycle lanes were painted on Donnington Bridge Road a couple of years ago, but they are generally obstructed by a small number of parked cars. The cars are parked half on the pavement, half on the road: the road is clearly not wide enough for parking. There is spare capacity in the side roads, and the whole length should be double-yellow restricted. 4) Raised side-road crossings. The new type of raised side road crossing that was installed along Iffley Road is very effective at giving pedestrians priority. These should be installed at all side roads, in due course. The next batch could be along Botley Road, to improve conditions for people walking from and to the Park & Ride. 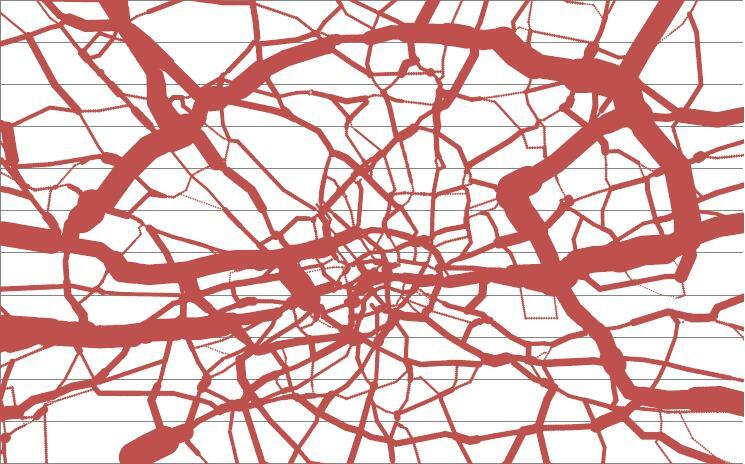 This chart shows motor-traffic volumes on main roads (A roads) in inner London. The data is from the DfT’s traffic counts for 2012, with junction codings made consistent (not a trivial task). There are huge traffic flows to the west, using the two big roads (the A4 and the A40). If you provide big fast roads, they fill with traffic (which then needs somewhere to park). Other parts of inner London, notably to the north, manage with roads that are nowhere near as big. Quite a lot of this traffic is unnecessary. The second observation is that flows can vary quite substantially along a route. Much of the traffic is short-distance: avoid falling into the trap of thinking that there’s lots of long-distance traffic that needs through routes. Most journeys from outer to central London are by rail, not road. This effect can also be seen in the way that flows diminish away from the big roads. Inner London has excellent public transport, and unless there’s a quasi-motorway, most people will avoid driving for any distance. The policy implications of this are well-known: traffic will disappear if you reduce roadspace. In north London, traffic could be suppressed further, for instance by removing general traffic from Camden High Street. If conditions for the on-street alternatives (buses, walking, bikes) are improved at the same time, all the better. In south London, the A road network could be simplified. Would it perhaps even be better to concentrate traffic on the Embankment, rather than creating a network of nasty junctions in Lambeth and Southwark? Cycling in London is peculiar. It is characterised by commuting several miles into central London. LCN+ and the Superhighways have – in different ways – both been aimed at providing for this middle-distance commuting market, partly to help relieve overcrowding on the tube. Unfortunately, these routes are often incomplete, or compromised. Key junctions remain risky, especially in central London, and inner south and east London. Fixing these junctions is proving very difficult, due to the volume of traffic using them. While this type of middle-distance cycling is certainly found in the Netherlands or Denmark (or in Oxford or Cambridge) it is not the norm in those places. Normal cycling is short-distance, little more than a mile or two, and includes a wide range of journey purposes. Commuting only accounts for a quarter of journeys – there are more trips for shopping than commuting. The situation in London is peculiar, but not inexplicable. The conditions for cycling aren’t good, so it is largely confined to the braver sort of cyclist. You need a certain level of commitment to even consider it. Public transport is very good, and crowding is tolerable over short distances, so people don’t tend to bother with cycling for short distances. Providing routes for longer bike journeys is easier, because you can avoid the difficult bits. And to top it all, key attractors for short journeys, such as town centres, are often in those difficult bits which cycle routes avoid. If cycling is to be normalised, the focus has to change to short-distance journeys, and for strategies to be more centre-based than route-based. Why hasn’t that already happened? In outer London, it hasn’t happened because there isn’t the demand for it. Most people drive, few cycle, and there isn’t much demand for that to change, alas. In inner London, the demand is there, but space on the main roads is too highly contested, making it very hard to get started on the difficult bits. Providing a fine-grained network for short-distance cycling is clearly a job for the borough, but on main roads TfL effectively has a veto, with traffic taking priority. So there’s a stalemate. To break out of this stalemate, some fairly substantial change will be needed at main road junctions – the sort of change that would cause traffic chaos if we weren’t simultaneously getting a substantial number of people out of their cars. So we need to change quite a lot in fairly short order, as a package. The change needs to be convincing enough that it leads to substantial modal shift, with fewer people driving, leading to less congestion, and fewer people using the tube for short journeys, leading to less overcrowding. Ideally we need to find an area where cycling is already fairly established (if not normalised), where car-ownership and use is quite low (but with scope to be further reduced), where the TfL trunk road network is fairly sparse, so there aren’t too many huge junctions to deal with, and where there’s a lot of short-distance tube overcrowding, ready to transfer to bike (or bus) if conditions on the streets improve. The best opportunity looks like Camden/Islington/Hackney. That isn’t to say that some other parts of inner London aren’t in need of a similar approach, or that work on key problem junctions (such as Aldgate and the Elephant) should stop. If the approach can be made to work in inner north London, it should certainly be attempted in other parts of inner London as well. But the best chance of success is in the north. What needs to be done? TfL, with the boroughs, needs to look at the main road network, and work out how much room can be made available for cycling, how much impact that will have on other modes, and how much traffic reduction will be required to make it work. And then they need to go for it. When trying to make streets better for cycling, there are a range of options. At one extreme you could close the street to through motor-traffic, at the other you could make separate paths alongside. With lots of road-sharing options in-between. The classic approach is to look at the current speed and volume of traffic, read off the type of provision required, and then see if it fits. If it does, fine; if it doesn’t, try to reduce the speed or volume of traffic so you can use something that does fit. The minimalist approach is to turn this on its head: given the space that’s easily available, how much do we have to reduce speed or volume of traffic to make it reasonably comfortable? And can we reduce speed or volume even more, to make it more comfortable? In some ways these are just versions of the same approach, but they can have quite substantial differences. If you’ve got space and money, perhaps building a new town or suburb, the classic approach is easier, and has been widely implemented in new developments in the Netherlands. Traffic is either fast or slow, and there are either tracks or nothing. The classic approach also works in tight-knit city centres – just exclude the traffic and the job’s done. But in older suburbs, especially ones that were laid out in the late nineteenth century, space on main roads is often at a premium. And in our larger cities, even though the streets are wider (courtesy of the Great Fire of 1666), the press of traffic can be quite severe. The classic approach would often call for segregation, but the space won’t readily be made available, especially at junctions. The minimalist approach is to start with the simplest intervention that gives clear space for cycling – the painted cycle lane, and look at how this can be made comfortable for a good number of cyclists. That’s initially achieved by keeping the speed of traffic down to 30mph or preferably less. It’s quite hard to get speed down if traffic has more than one lane for any distance, so this only really works for upto about 20,000 cars/day. But that’s plenty enough traffic for most main roads in most towns. There are various things that can be done to slow main road traffic. It helps if the road is enclosed by buildings, but putting in cycle lanes, narrowing the traffic lanes to 3m or less, removing the centre line, putting in raised crossings of side roads and frequent pedestrian crossings all help. Refuges can work, but should really be part of a continuous median, otherwise cyclists will tend to get squeezed. Zebra crossings are better. It usually takes some time – years – to implement all these measures and get traffic to slow down. But when the traffic has been slowed, cycle lanes are fairly comfortable, and acceptable to a wide range of adult and teenage cyclists. If you’ve got the space, bus lanes (or wide cycle lanes) can be effective, but it’s harder to get the traffic to slow down. Generally, bus lanes are a good idea if there is peak-time congestion – buses and drivers don’t come cheap, and we need a good bus service to provide for longer journeys. But wide cycle lanes will probably just lead to faster speeds. The minimalist approach also applies at junctions: try to give an obvious, easy route for cyclists going straight-ahead, but don’t try to segregate cyclists. Instead get the traffic to slow down, and work around the cyclists. In low-speed environments, drivers are perfectly capable of sharing safely, as long as they can understand what the cyclist is doing. The trick is to get everyone going slowly, so bikes only get in the way briefly. Similarly at roundabouts, there are Swiss designs that slow the traffic down to cycling speed, so that the road can be comfortably shared. This takes up much less space than the Dutch segregated roundabout designs. It won’t be comfortable for family cycling, at least not for quite some years, but it is very effective at making roundabouts tolerable for a lot of adult and teenage cyclists. 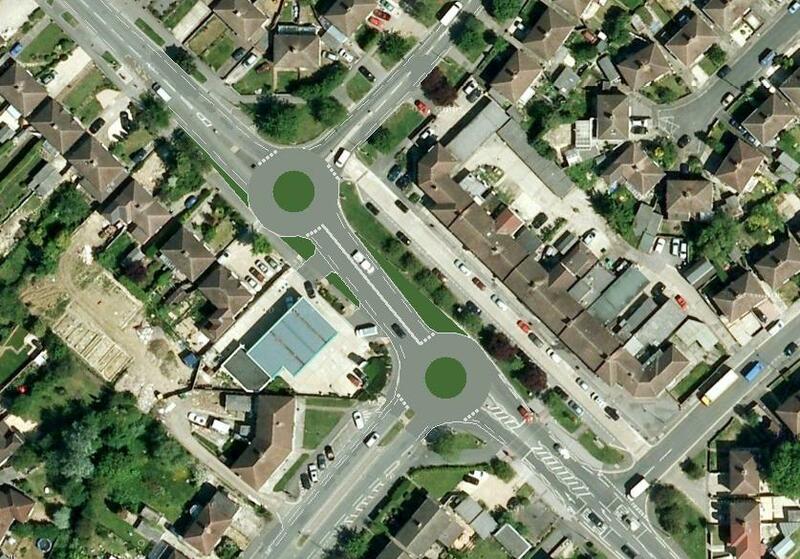 However, these roundabouts don’t work for bigger junctions (more than about 25,000 cars/day). Bigger junctions have to use traffic lights. Why do I call this “Dutch” minimalism? Well partly because it’s about cycling, and “Dutch” is almost a synonym for cycling. Partly also because some of the most famous minimalists were Dutch – painters like Mondriaan (an early exponent of the creative uses of white paint). But also because the minimalist approach is very much based on the principles for bicycle planning that have been developed in the Netherlands. The facilities are very much aiming to be cohesive, direct, attractive, safe and comfortable, in classic Dutch style. It’s just that we are also actively trying to restrict ourselves to the simpler forms of facility, to leave more space for pedestrians, and to take space from the road as much as we can reasonably manage. The bicycle is a very efficient form of transport; we should aim to be efficient in its use of space, as well. If you are trying to fit in cycling from scratch in an existing congested city, it’s probably the only way. What does Dutch minimalism ultimately look like? The end result will probably be 20mph main roads with cycle lanes. Pavements will be wide, and parking limited. Cyclists will have the freedom to use all roads without being constantly threatened by passing traffic. Pedestrians will be able to cross roads pretty much at will. That’s what I mean by a Transport Paradise. Quite often there isn’t room for a Dutch-style roundabout. The Swiss have experimented with the geometry of roundabouts to make them as cycle-friendly as possible, with cyclists still on-road. This is unlikely to be comfortable enough for family cycling, so alternative quiet routes will also be needed that avoid the area. The roundabouts need to be big enough so the entries can be tight, but not so big that cars try to overtake bikes on the roundabout. The diameter of the roundabout should be 24-34m, and the circulating carriageway should be no-more-than 8m wide. The Swiss advice is that exits should be quite open, to avoid the risk of cyclists getting cut up on exit. The design can cope with quite high traffic levels – upto 30,000 motor-vehicles per day, according to the Swiss. 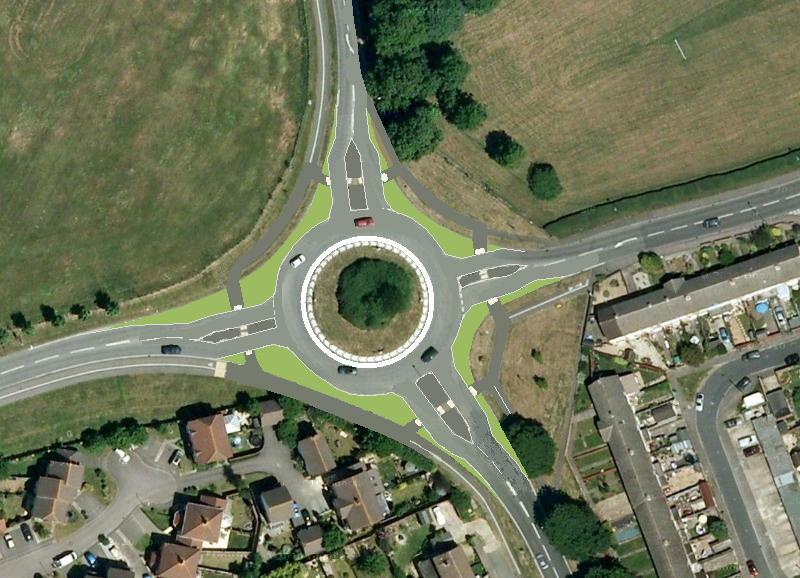 This is a sketch design for a pair of mini-roundabouts in Marston, Oxford. The give-way lines have been moved back to make a bigger roundabout with a solid island, and the number of approach lanes reduced to one on each arm. Cycle lanes have been added on all the approaches. The road between the two roundabouts has been narrowed and angled, to slow the traffic. The original aerial imagery is from Google Maps. Roundabouts are often used to reduce congestion, but conventional UK designs aren’t cycle-friendly (or pedestrian-friendly). The Dutch have developed a design for an urban cycle-friendly roundabout, but it takes quite a lot of space. The full design has a completely-circular cycle track, set back from the roundabout by 5m (one car-length). The minimum size for the roundabout itself is 25m diameter, with a 13m island. Including pavements, you need a minimum 45m diameter. 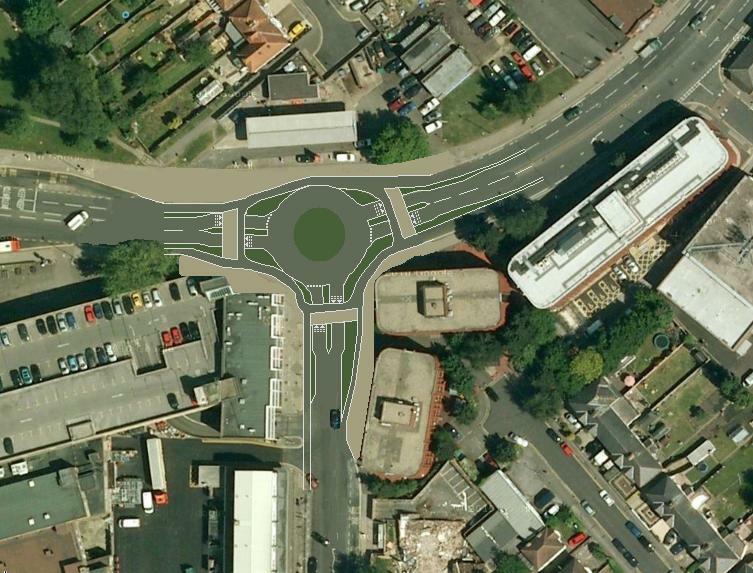 This is a sketch design for the junction where Barns Road meets Between Towns Road in Cowley, Oxford. The junction is moderately busy, and is currently a mini-roundabout with a bypass lane. The roads in the area are unnecessarily wide, and there are no reasonable quiet routes. So it makes sense to provide segregated cycle tracks along Between Towns Road, and make the junctions as cycle-friendly as possible. A full Dutch roundabout doesn’t fit, but by judiciously distorting the circular cycle track, it can just about be squeezed in. It is important that the cycle track splits several metres before each crossing, and cyclists approaching the crossing shouldn’t have any sharp turns. This makes it clear to motorists that the cyclist is crossing, and they should give way. The roadway had to be extended by a few metres northwards at the junction, into a grassed area. The original aerial imagery is from Google Maps. Market towns often have a single-carriageway ring road or bypass with roundabouts. This will usually cross the route between nearby villages and the town, for instance for going to secondary school, visiting friends or shopping. Speeds will typically be 40mph, with flared entries and exits, and these roundabouts are not-at-all pedestrian or cycle-friendly. A Toucan crossing could be provided a little way from the roundabout, but this will typically be considerably slower than risking the roundabout, as well as moderately expensive. The junction could be converted to traffic lights, but this costs even more. This is a sketch drawing for the Wootton Road roundabout north of Abingdon. The design is close to the Dutch standard design for such situations, with bottle-shaped islands on each arm to slow the traffic down, and cyclists on tracks, giving way to cross each arm. Most cyclists will go north-south, and will have to give way twice in quick succession at relatively stress-free crossings. This compares reasonably to having to give way once to enter the roundabout. The green areas are road that would be returned to grass. The existing cycle tracks/pavements and crossing points have been used. Although most cycling is within cities, there’s no reason why the outer estates should be cut off, and every reason to encourage people to cycle out into the countryside. In an ideal world, there would be excellent tracks, bridges and tunnels alongside the main roads, but sometimes there isn’t space. Quite often the existing junction is a simple oversized roundabout. How do we make that cycle-friendly? 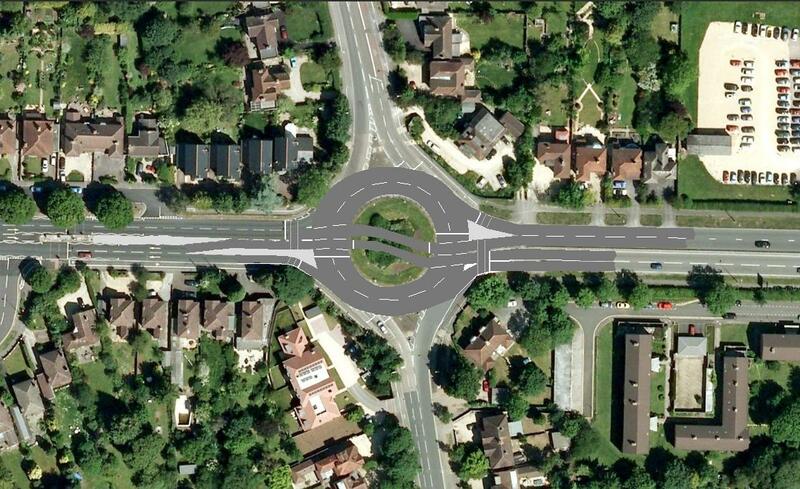 This is a sketch design for a roundabout to the north of Oxford, where Banbury Road crosses the ring road. A number of Oxford’s peripheral roundabouts have already been signalled, and a couple have had lanes cut through the middle (known as hamburger roundabouts or throughabouts). But the best that’s been achieved for cycling is staggered Toucan crossings. Can we do better? The cunning aspect of the design is skewing the straight-ahead throughabout lanes, so there’s a gap between the two exit lanes. When traffic is flowing from the ring road entries (east-west), there should be very little traffic wanting to use the conventional roundabout exit lanes. So those exits can have a red signal, for cyclists and pedestrians to cross. When traffic is flowing from the radial entries (north-south), the other ring-road lanes all have a red signal, for cyclists and pedestrians to complete the crossing. With good separation between the two crossings, they don’t need to be staggered.